This website covers numerous golf fitness tips, ranging from swing tips, weight training for golf, flexibility and even training devices such as foam rollers. But what the history of fitness in golf? What is the underlying rationale for why we exercise and what are the benefits of exercise? That is exactly what this section of Golf Fitness and Training Tips is about! The top golfers in the world have been following golf fitness tips for years now. However, until recently, many amateur and recreational golfers haven't discovered the benefits that a golf strength training program can bring them. Comparing the present time to forty to fifty years ago, there has been a tremendous push for physical fitness in all aspects of our lives. Even professional sports teams did not have off season strength training programs for their players back then. Compare the average size of an NFL player from the 1960s until now and you will see an huge difference. Exercise guidelines for children have also changed over time. The US Centers For Disease Control recommend 60 minutes of aerobic exercise each day, in addition to muscle and bone strengthening activities multiple times per week. It is a fact that the obesity rate in children in the U.S. is higher than it was 50 years ago (due to numerous factors that I won't go into here), but the push for exercise also have never been greater. The necessity for fitness in golf has exploded over the last twenty years, and even specifically once Tiger Woods came onto the scene. Woods quickly rose to prominence in the mid to late 1990s, and in order to catch up, many of the then top golfers starting ramping up their own programs. Tiger was (and is) tall, lean, and muscular. He represented the new breed of golfer, and if you look at the physique of many of the current top golfers, you will find many of the same attributes. An average golfer probably takes about 100 full swings per 18 hole round (figuring in drives, fairway woods, long irons, and practice swings). Combine that with walking 7500-8000 yards per round (no carts!) and you quickly realize the importance of golf fitness. This entire website is dedicated to improving your golf game through exercise. Check out the links below, but also explore any of the numerous exercise specific pages that I have. 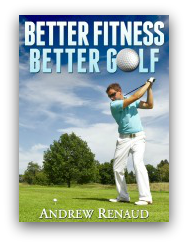 I'm sure that you will find some golf fitness tips that will prove beneficial! Before you begin your golf fitness program, it is a great idea to familiarize yourself with general fitness guidelines and the benefits of exercise. Living a healthy lifestyle will benefit your in numerous ways, not only on the golf course, but in your daily life as well. Golf specific exercise is not to be confused with your run of the mill exercise program. Not only do you need to target specific areas of your body, but you need to train in a very specific way to properly prepare yourself for golf. My Fitness And Golf page will provide you with all of the basic information that you need to educate yourself prior to starting your program. All of the top PGA pros have discovered what a solid training program can do to their golf game. They have the top trainers working with them, maximizing their strength and flexibility in order to generate more power and distance. However, what happens when they get injured, or are at a tournament? The PGA has already thought about that, and supplies fitness trailers at each of the Tour stops where golfers can exercise or get treatment. Click here to learn more about how to PGA takes care if its players. Just like with any other sport, proper nutrition is essential for maintaining energy on the golf course. Golf nutrition means knowing when to eat, what to eat, and also what to avoid. If you notice that you struggle with fatigue near the end of your round, a few quick changes to your routine can easily increase your endurance. Honestly, changing your pre and mid round eating habits is one of the easiest, yet most effective golf fitness tips I can give you! Learn more at my Nutrition For Sports page. While certainly not golf specific, one very important thing that you need to learn when exercises is how to calculate your target heart rate. This is significant because you need to train within this zone to maximize the effects of exercise. Likely the most reliable way to calculate this is by using the Karvonen formula. Just punch in a few numbers, and you will have a target range that is specific to you! Read more here! One very common fault that is present with amateur golfers is poor posture. The main area where you will see this is at both the low and mid back. This is extremely important because if your spine is at a disadvantaged position, it could lead to lack of range of motion, decreased power, and at worst, injury. Click here for specific posture exercises for golf to help correct these issues. In addition to specific exercises, there are many small things that we can do on a day to day basis to help correct, and even prevent, postural abnormalities. Many of us have jobs or perform daily activities that put us in positions that can lead to muscle imbalances. To learn more about posture correction strategies that you can easily implement to help your posture, and in turn your golf game, click here. A significant portion of your golf fitness program should be dedicated to stretching and flexibility. Despite it's importance, many people fail to understand the benefits of stretching. In order to take full advantage of your swing, you need to have full, unrestricted range of motion. Many of us suffer from muscle imbalances which can rob us of power! The benefits of stretching are numerous, and if you would like to learn more, please click here. From a neurological perspective, one of the key things that we try to accomplish with practice (whether we realize it or not) is muscle memory. The term muscle memory is technically misleading because it is your brain doing the learning, not your muscles. This is important however, because if we have good practice habits, and are doing things the proper way, it will because second nature over time! This is true for any action we perform. To learn more about motor learning and muscle memory, click here. Whenever you are beginning an exercise program, and especially at home, you need to make sure that you have the right equipment. If you are looking to create a golf-specifc workout space at home, there are a few key pieces of equipment that you need. Fortuneatly, none of these individual pieces are that expensive. Actually, you can create a very effective home gym for even $100 or less! To learn more about home workout equipment for golfers, please click here. One very important, yet often overlooked, component of a golf fitness program is a pre-participation screen. The Functional Movement Screen (FMS) is quickly being adopted as one of the most common screening tools not only for golf, but for all sports. The read more about the FMS and golf-specific implications, please click here. Also, I have written a page about the non-FMS functional assessment which goes into further depth regarding exactly what fitness professionals are looking at prior to designing your program. Read more about it here. 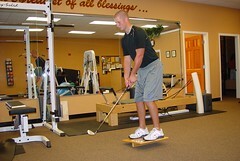 Finally, the last area of the Golf Fitness Tips section of my site deals with strength training for golf. This page is not full of specific exercises, rather, it is an explanation of the rationale of golf specific weight training. It breaks down my underlying theories for training, and which general types of exercises should be included in a exercise routine, and when to include them. Click here to learn more about strength training for golf. If you would like to learn more about the specific differences that older adults face when beginning an exercise program, then please click here to read about strength training for seniors. It also is safe for children to participate in a golf fitness program, provided adequate supervision and instruction. Read more about golf training for kids here. Finally, there are a few subtle considerations to take into account if you are a female beginning a workout routine. Read more about strength training for women here.